Island green? Check. Waterfalls? Check. Fescue? Check. Swerving, who-knows-where-your-ball-is-going greens? Check. Old historic bridges? Check. Sweetgrass Golf Club's par-5 ninth and 18th holes share a green. That sounds like a list of all the different things you might want in one golf trip. 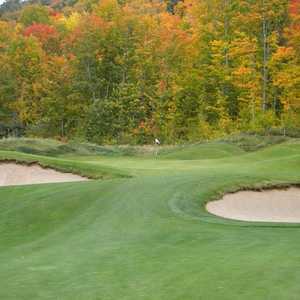 You can find them all, however, in one new golf course in Michigan's Upper Peninsula. The very ambitious Sweetgrass Golf Club at the Island Resort & Casino, which recently opened, packs all those obstacles into its 7,273 yards. Set on 320 acres on Hannahville Indian land in a largely unspoiled nature region, Sweetgrass is a design from Michigan architect Paul Albanese that's geared toward making this spot a genuine golf destination. Two hours from Green Bay, three and a half hours from Milwaukee and five and a half hours from Chicago, Sweetgrass and the Island Resort definitely offer a secluded getaway. The goal is to make it a retreat that will bring golfers close and far. For Sweetgrass is not opening as just a stand-alone golf course. Island Resort is offering stay-and-play packages that include the chance to play the highly-rated Greywalls at Marquette Golf Club and TimberStone Golf Club as well. It's the three golf courses as a combination that could vault this area into the upper echelon of Michigan's often underrated golf scene. Greywalls, TimberStone and Sweetgrass Golf Club are all within an hour of each other, which qualifies as a very short commute in this part of Michigan. "With Greywalls, Timberstone and Sweetgrass, that's three top-notch places to play," Sweetgrass Director of Golf Dave Douglas said. "It's a reason to come and golf here." Douglas grew up in Michigan's Upper Peninsula and has spent his golf career in the region too. This Yooper (that's what many people in the U.P. proudly call themselves) is seeing a drastic change in the golf in his home region. "It's building to a lot more upscale golf area," Douglas said. "The majority of golfers we're seeing now travel in from outside the region to come in and play. It's definitely more of a destination." Which doesn't mean it's become expensive yet - especially by the standards of other golf hot spots. Two nights at the Island Resort & Casino and three rounds of golf broken up any way you wish (you can play one on each of the three courses, all three on Sweetgrass or whatever combination you choose that adds up to three rounds) starts at $229 per person in double occupancy packages. Sweetgrass itself is starting out charging a $75 greens fee, though that drops to $56 if you sign up for the casino's frequent-player card. For that you get a golf course with some ultra wide fairways (a few are more than 80 yards across) that will probably look older than it is. That's in no small part because a number of old Michigan bridges have been rescued from planned destruction and placed around the course. So much for cookie cutter. "It kind of has a links appearance," Douglas said. "But it's obviously not a true links course." The tall fescue grass and the water (wet stuff's on 10 of the 18 holes) add another dimension to Sweetgrass, the course where they seemingly tried to fit everything in. The Island Resort already has a 1,300-seat auditorium and 275 rooms from a major 2005 expansion. Now the plan is for the golf course to help fill those rooms and draw people to the casino and the Upper Peninsula in general. As with many Native American Indian courses, the sheer amount of space at Sweetgrass can catch golfers by surprise. "It's very playable with very generous fairways," Douglas said. "There are 47 acres of fairways here. 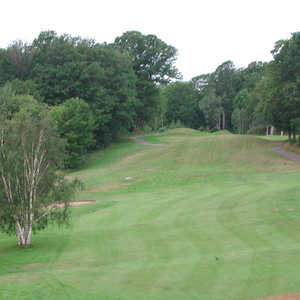 On a typical golf course there is about 28-30 acres of fairways. So there's almost 50 percent more fairway space than your average course. You have a great chance to get a good drive out there and put yourself in a good position." Two nearly 10-foot waterfalls running near the shared ninth and 18th green have already made for a nice conversation starter. Both No. 9 and No. 18 are par 5s at Sweetgrass. "Nine and 18 are really unique," Douglas said. "It's a tiered pond with a number of falls in-between each tier." Still, the par-3 15th island green figures to have golfers talking the most. It's only 165 yards from the back tees, going to as short as 100 yards from the forward tees, but the water's there to make it seem much longer. Albanese also served as the lead architect on TimberStone, a Jerry Matthews design which received five stars from Golf Digest when it opened. Now Timberstone has company, and Michigan's Upper Peninsula could have a much stronger golf draw.